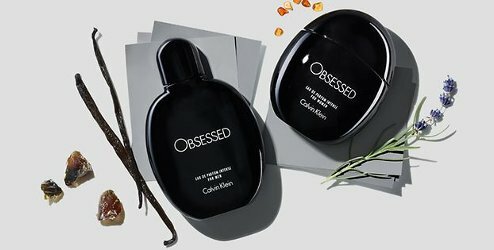 Calvin Klein has launched new Obsessed Intense fragrances for women and men. The Obsessed Intense duo are flankers to last year's Obsessed. Iconic. Sensual. Powerful. Instinctive. 'Obsessed' intense CALVIN KLEIN is the deeper exploration of a story of past love and romance. Unbound by traditional female and male fragrance structures, the two perfumes know no rules. Genders are subverted and layered, with the traditional scents of the masculine fougère particularly white lavender harnessed for the women's fragrance, while the men's scent is in thrall to a dark vanilla. For 'Obsessed' INTENSE CALVIN KLEIN, memories of infatuation are unravelled by the addition of an amber warmth and higher concentration of oils to evoke a nearly tangible feeling of sensuality and the reminder of the scent of another on the skin. An echo of an iconic romance. A memory of past love. A celebration of intensity. A powerful and hypnotic warmth lingers. Calvin Klein Obsessed Intense for women is available in 30, 50 and 100 ml Eau de Parfum. Obsessed Intense for Men is available in 30, 75 and 125 ml Eau de Parfum. Is that why they release traditionally structured female and male versions? HA, no kidding. Why not just get the CK One and be done with it? “Obsessed Intense” sounds way too stressful for me!